Description: Phacelia nashiana is a mostly erect annual herb producing a small branching or unbranched stem up to about 18 centimeters tall. It is coated in short, stiff, and gland-tipped black hairs. The hairy, glandular inflorescence is a one-sided curving or coiling cyme of bell-shaped flowers. 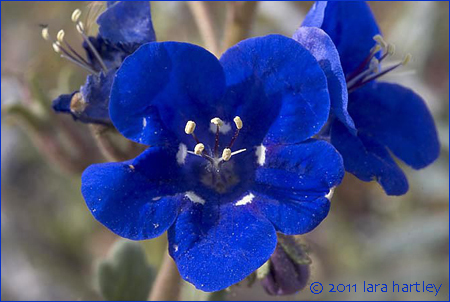 Each flower is 1-2 cm long and brilliant deep blue in color with usually five small white spots above the white tubular throat. It has five protruding stamens tipped with white anthers. Leaf: The leaves, which are mostly arranged around the base of the stem, have shallowly lobed oval or rounded blades on stalks a few centimeters long. Notes: Charlotte's phacelia is known only from the area where the Sierra Nevada junctions with the Mojave Desert. This photo was taken on April 2, 2005 in Short Canyon, Kern Canyon, California. 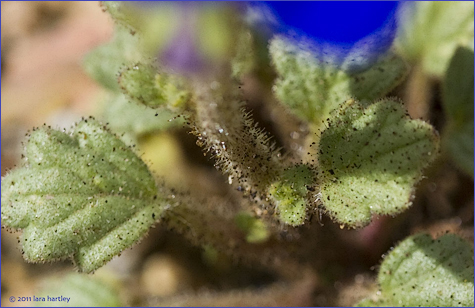 Phacelia nashiana is a dicot that is native to California and is endemic (limited) to California alone. 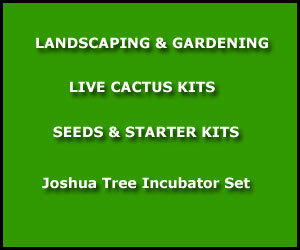 It is included in the CNPS Inventory of Rare and Endangered Plants on list 1B.2 (rare, threatened, or endangered in CA).